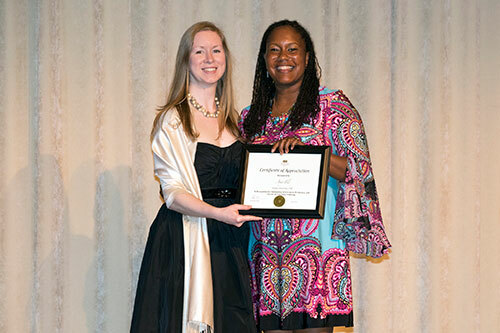 Veterinary Technology Program Director Bianca Zenor (PU DVM 2001) presents the Veterinary Technology Highest Technical Proficiency Award to Hailey Parr at the inaugural PVM Graduation Gala held May 13. The award, sponsored by Connie Han (PU AS-VT '80) and Cheryl Hurd (AS-VT '85), veterinary technicians who own CH2 Imaging, recognizes a veterinary technology student for outstanding technical proficiency in clinical rotations in the Veterinary Teaching Hospital. The Purdue University College of Veterinary Medicine launched a new tradition as part of May commencement this year by hosting the first Graduation Gala May 13. 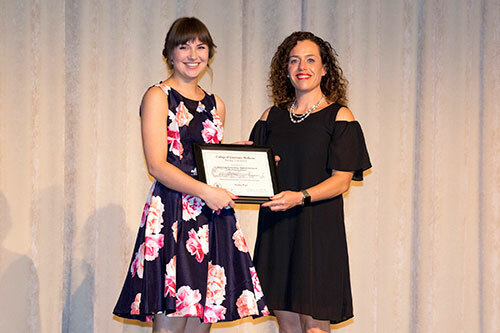 Designed as a special evening of recognition for the College's 83 DVM and 47 veterinary technology degree candidates, the event was held in the Purdue Memorial Union North and South Ballrooms and included the presentation of some 30 student awards. Before the evening's dinner, PVM Dean Willie Reed welcomed everyone, noting in particular the strong turnout of family, friends and loved ones. "Graduation is a major milestone which is the culmination of years of dedication and hard work," Dean Reed said. "For many of you, earning your DVM or Veterinary Technology degree has been a lifelong goal. And now you've done it! You have grown as professionals and as individuals and you are prepared to begin a new phase of your life as doctors of veterinary medicine, veterinary technologists and veterinary technicians. We are proud to have you represent the Purdue College of Veterinary Medicine!" DVM Class of 2017 member Amy Flis receives the American College of Veterinary Pathologists Award for Excellence in Veterinary Pathology from Dr. Tiffany Lyle, assistant professor of veterinary anatomic pathology in the Department of Comparative Pathobiology. The award recognizes the recipient for exceptional proficiency and interest in anatomic and/or clinical pathology. Dr. Flis now is headed to North Carolina State University to begin a residency in anatomic pathology. In addition, Sarah Rood, a clinical year veterinary student from Ross University received the Veterinary Clinical Sciences Department Award for Exceptional Clinical Proficiency by a Clinical Year Student. The award was established to recognize the tremendous effort and contributions made by students from Ross University and St. George's University who are enrolled in the Clinical Year Program at Purdue. In addition, two awards were presented under the category of Special Recognition. Jacqueline Pacheco received the PVM Class of 1983 Award, which honors a fourth-year veterinary student who has overcome obstacles or persevered despite difficult circumstances in the pursuit of the DVM degree. The award was created on the occasion of the Class of 1983's 25th reunion in honor of their classmate, Dr. Madelynn Allen, who worked multiple part-time jobs all through veterinary school so she and her husband could pay their bills and support their three children. Dr. Allen died of cancer in 2013 at the age of 63. The Class of 1983 was represented at the Graduation Gala by Drs. Andrew Dircksen, Charles Johnson and Douglas Thieme, all parents of members of the DVM Class of 2017. 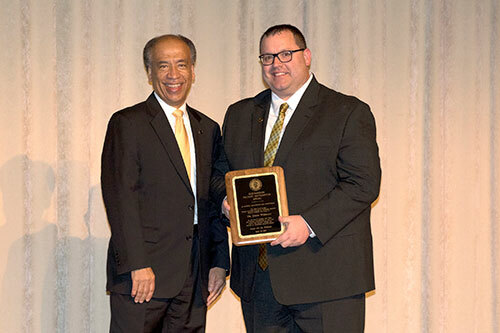 Clayton Carr received the Purdue Veterinary Alumni Association (PVAA) Senior Leadership Award, which is given to an outstanding fourth-year veterinary student selected by classmates based on academic performance, activities, and leadership. Also during the program, a PVM intern and resident were honored with awards recognizing outstanding teaching and the qualities of compassion and empathy for patients and their families. Dr. Mark Byrum, an intern in the Small Animal Hospital, received the Katie McCallister Compassion Award, which was established by Dr. Robert and Sandy McCallister and their family in memory of Katie, their Sheltie. The award is for a resident or intern who demonstrates extraordinary compassion and empathy, possesses excellent communication skills that promote a sense of trust and confidence, and serves as an excellent role model for both students and peers in providing quality and compassionate care for their patients. Dr. Byrum is the first intern to receive the award. After his Purdue internship, he plans to complete an oncology residency at the University of Illinois. Dr. Tony Rumschlag (PU DVM '85), representing Elanco, presents the Elanco Veterinary Technology Outstanding Teaching Award to Tami Lind (PU BS-VT 2010), small animal ICU/ECC technologist supervisor in the VeterinaryTeaching Hospital. Dr. Benjamin Begstrom, a third-year resident in ophthalmology, received the Dr. Ann L. Johnson and Dr. Walter E. Hoffmann Resident Teaching Award, which was established by Dr. Ann Johnson (PU DVM '75) and her husband to recognize outstanding teaching by a resident in the Department of Veterinary Clinical Sciences. Dr. Johnson is a Purdue veterinary alumna and a board-certified veterinary surgeon who spent her career on the faculty of the University of Illinois College of Veterinary Medicine. The award honors those residents who are particularly effective in fulfilling their responsibility to provide instruction to veterinary students. Dr. Bergstrom plans to enter a private specialty practice in Nashville, Tenn., after he completes his residency this summer. Dean Willie Reed presents the Weedon Faculty Recognition Award to Dr. Jim Weisman (PU DVM '97), clinical associate professor and director of Student Services. 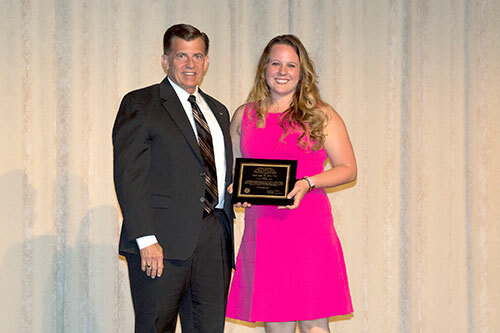 The award honors the individual faculty member who has made the greatest contribution to members of the current fourth-year veterinary class during their progress toward their DVM degree. Dr. Jim Weisman (PU DVM '97), clinical associate professor and director of Student Services, was honored as the recipient of the Weedon Faculty Recognition Award. The award recognizes the individual faculty member who has made the greatest contribution to members of the current fourth-year veterinary class during their progress toward their DVM degree. The selection is based on a vote by the current fourth-year students. Dean Reed, who presented the award, praised Dr. Weisman as a PVM alumnus "...who works tirelessly to improve the learning experience and professional development of our students." The inaugural Graduation Gala, which was supported by the Purdue Veterinary Alumni Association, concluded with the Final Discharge celebration and dance, formerly known as the Medicine Ball, to give all the attendees the opportunity to celebrate, dance and socialize. Photos of the Graduation Gala were taken by professional photographer Ed Lausch and are available on his website to be viewed and purchased online at www.lauschphotography.com. Enter the Username "2017gradgala" and the Password "13may2017" to view the photos.